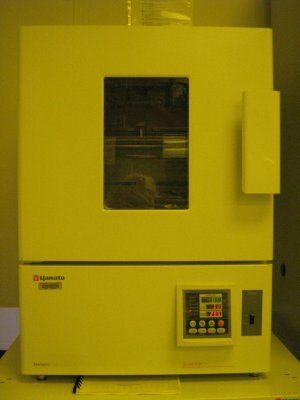 The Yamato Scientific mechanical convection oven has a temperature range of 0°C to 320°C. The curing oven temperature can either be manually changed by setting a fixed temperature, setting a fixed temperature for a set time, or running an automated process with programmable ramp times and temperatures. The maximum set time is 999 hours and 50 mins.